Your classroom can earn a free Skype author visit. 1) Print this book/CD order form and send it home with your students. 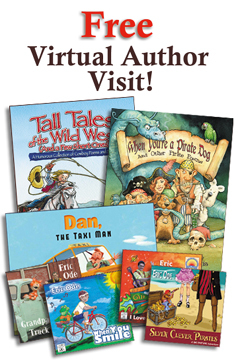 2) With the purchase of any 20 or more books and/or CDs, your class earns a free 40 minute virtual classroom visit with Eric Ode. 3) Eric will sign and ship the books/CDs to your school. We cover the cost of shipping. 4) After you receive your order, schedule your free Skype visit. "Our sixth grade reading class had their first ever Skype session with Eric that couldn't have gone better. Eric not only entertained our students and made them very comfortable, but he gave complete responses to our questions. As a teacher, I would highly recommend having a Skype session with Eric for any elementary or middle school reading/literature class." "To have a real author HERE with us.. and with the students responding as you read, Eric... so joyful!" Nothing tops live author visit workshops and assemblies for building enthusiasm for literacy. For some schools, however, limited budgets or the school's remote location keep live visits out of reach. That's where virtual author visits come into the picture. 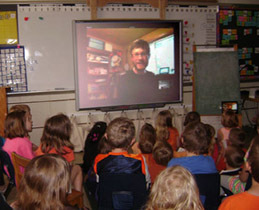 With a bit of internet technology, students can benefit from many of the same experiences awarded by live author visits. Why schedule a "virtual visit"? Sessions are live, interactive, and fun! They are easy to schedule. They are less expensive than live visits. Students find virtual visits entertaining, engaging, and just a little mysterious! There's a good chance your school already has everything you need to make a virtual author visit happen. a large computer monitor or a projector and screen and audio speakers (so you can see and hear me). a webcam and microphone (so that I can see and hear you)! Most webcams have a microphone built into them.